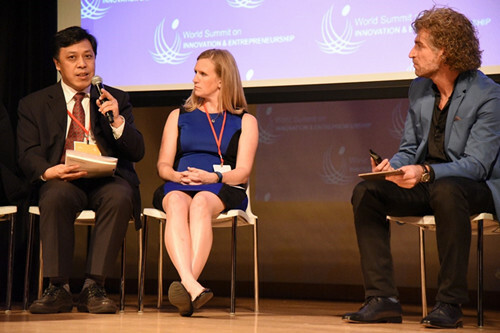 From October 2 to 3, the 11th World Summit on Innovation and Entrepreneurship was held in New York. More than 1,000 representatives from over 50 countries attended the conference. The theme of this conference was "Human and Machinery: Business in an Intelligent Era," which explored the wisdom and intelligence of participants through exchanges and collisions in various forms such as innovation salon, innovation forum and round table conference The opportunities and challenges that technology can bring to human society. On the afternoon of October 3, the World Innovation Organization (WIO) held a grand ceremony. WIO, as a newly established international innovation and entrepreneurship organization, has extensive participation of famous universities and multinational corporations. Researcher Pan Jiaofeng, dean of the Institutes of Science and Development,Chineses Academy of Sciences (CASISD), was elected Fellow of WIO. At the WIO Inaugural Conference, Mr. SAM, Chairman of the World Innovation and Entrepreneurship Summit, attended and presided over the conference. More than 100 key guests from scientific institutions, universities and enterprises were all organized around topics such as "Changing Human, Geographical, Product, and Peaceful Artificial Intelligence" group discussion. In the discussion, Pan Jiaofeng explained "adaptable human-machine relationship," arousing strong resonance among participants. At the closing ceremony of the World Summit on Innovation and Entrepreneurship, Pan Jiaofeng was also invited to give a keynote speech on "Science and Future Life." He pointed out: Today's world development is in an era of great readjustment and major readjustment. The progress of human civilization, the mode of development, the pattern of the world, science and technology innovation, and overall innovation and development in China are all at an important turning point. Science and technology are the key to unlocking the future. Driven by the revolution in science and technology, science and technology will form a society in which human-computerized ternary systems are integrated. In the next 20-30 years, we will take the promotion of the three-way integration of human-computer science as the direction and the development of the digital economy, smart city and smart society as the starting point and constantly innovate the modes of development, modes of production and lifestyles, and shape the sustainable development of mankind Knowledge and civilization form. He emphasized that China advocates openness and inclusiveness, pursues mutual benefits and win-win results, and promotes the common prosperity and progress of civilization of mankind. Pan Jiaofeng's speech won the audience warm applause. Chairman SAM said that the World Summit on Innovation and Entrepreneurship will further strengthen its all-round cooperation with China.